Sharp’s first air purifier for the U.S – Sharp FP-F50UW looks like a fresh new budget device, but it is still higher than most of the common budget air purifiers. It comes with a new and improved air cleaning technology that is exclusive for Sharp devices. Get ready for our latest Sharp FP-F50UW Review. Sharp is a Japanese multinational corporation, with more than 100 years old in history of designing and manufacturing electronic products. They have been a long-time leader in the whole Asian region, but just like Coway, they only send few of representatives to the U.S market. Today, we will start with our Sharp FP-F50UW Review. The Sharp FP-F50UW stormed onto the scene in 2016 sporting a, well, sharp design and good specs. It is made to be an instant hit at the budget end of the air purifier market. However, I believe that the Sharp FP-F50UW does not have an affordable price anymore, because more and more other brands can keep the price below $200. Even with a recent cut of $50, the Sharp FP-F50UW is still far from what Winix and Coway can do. It slotted in below the Sharp FP-F60UW, propping up Sharp’s Plasmacluster and Quick Clean mode at the competitive low-range price point. Yes, the Sharp FP-F50UW costs you $279, a price that can be similar to the Whirlpool WP1000, Philips 1000i or Oransi Finn. But to be fair, the top competitors that can threat the position of Sharp FP-F50UW are even with $200 or less. The trio from Winix: Winix 5300-2, Winix 5500-2 and Winix C535 are having the similar technology and better fan power, but with a much more enjoyable price tag than this device. It has also been replaced by the Sharp FP-A80UW, and though you can still find the air purifier available with our deal below, it seems this company completely ignore the entry product. It is not easy to find the filter replacement, and you can see a lot of complaints for this issue on Amazon. Sharp FP-F50UW Plasmacluster Ion Air Purifier with True HEPA Filter. Energy Star rated. Recommended for small room areas up to 210 square feet. Like all recent air purifiers the Sharp FP-F50UW has a white coat for the whole body. With rounded (not sharp) edge, this air purifier looks a lot like the GermGuardian AC9200WCA or Alen BreatheSmart FIT50. Of course, the smooth plastic is used to cover the back and front of this air purifier. That shell actually improve the bright color in the Sharp FP-F50UW, which can’t achieve by any other colors, though. The base of this air purifier is way much smaller than normal, but the Sharp FP-F50UW is bigger in the bottom and it is really hard to make it laying on the ground. For the dimension, the Sharp FP-F50UW is 21.6 inches in height and 15 inches in width. This size is normal for a portable air purifier, and the white color can easily match your decor. The Sharp FP-F50UW features a bottom-to-top air flow system, with the air intake grill from the back. So to say, you must place this air purifier with a distance from the wall or other furniture so it can operate properly. The air outlet is set on top and near the air intake, so the fan won’t need to be as powerful as in a 360° air system like Honeywell HPA300. This air purifier has a little bit complex control panel. It is reasonable, because the Sharp FP-F50UW packs lots of feature on it. This air purifier only weighs 10.5 lbs, which is just 1.25 gallons of milk. With two handles on both sides, you can easily move it around your home. When we decide to buy an air purifier, we need to know about the air filtration process and what air filter types are used. Sharp FP-F50UW represents the Japanese strongest air filters, with a 3-stage air cleaning system. You may be surprise, as the air cleaning system in this Sharp FP-F50UW is similar to exactly the Winix C535. The only different is the name of its technology, as Sharp called it Plasmacluster, while the Winix named it PlasmaWave. However, the Plasmacluster technology has a same working mechanism, emits both negative and positive ions, to form hydroxyls that decompose the protein and suppressing activity of the viruses. This technology can even remove static electricity. The True HEPA filter from this Sharp FP-F50UW is the high-quality one that can remove any common household allergens such as dust, pollen, pet dander, and smoke from the air. With more filter media, this air filter can last for 2 years, which is 2-4 times longer than the normal HEPA filter. There are many candidates to compare with the performance of this air purifier. So I chose the strong contestants, the Coway AP-1512HH, AeraMax 300 and the Blue Pure 211. They will all run in the same testing conditions: a space of 150 sq ft, a duration of 1 hour. As you can see from the below chart, the Sharp FP-F50UW is quite weaker than others, with only efficiency of 99.93% for trapping any allergens as small as 0.3 microns in size. But don’t worry, as in real-world use, such efficiency is too high for a portable air purifier. And the filter cost of the Sharp FP-F50UW is about $86, which means $43 for the annual filter cost. It is quite good, especially when compare with the high filter cost of the Winix C535 or Oransi OV200. One biggest drawback for the performance of this Sharp FP-F50UW is the weak fan. For a cheaper price, a Honeywell HPA300 can double the CADR rating of the Sharp FP-F50UW with ease. The manufacturer suggest to use this air purifier for a room of 210 sq ft, and it is quite sufficient for the fan power. The ACH of Sharp FP-F50UW is 4X. With this air changes per hour rating, this air purifier can clean your room every 15 minutes. The CADR of Sharp FP-F50UW is 153 Dust/ 133 Smoke/ 155 Pollen (cfm). If you need an air purifier that can clean your room faster, you should look for the Winix 5300-2 or Honeywell HPA200. They are only below $200, and have the same quality for the air filters as the Sharp FP-F50UW. But, as a unspoken rule, a weaker fan means a more silent air purifier. The Sharp FP-F50UW has 3 fan speeds, and if you are running this device, you will enjoy the exclusive LibraryQuiet operation of the Japanese company. I measured the lowest noise level of this Sharp FP-F50UW only 29 db, and it is even more silent than the whisper. Even if you switch to the highest setting, the noise level is only 45 db, and won’t annoy you at all. Many people have complained about the crackling noise of the Plasmacluster, but in 2 weeks of testing, I’ve never heard any sound like this from my Sharp FP-F50UW unit. I will update the status as soon as I find anything wrong for you. But until then, I believe this is one of the quietest air purifiers in the world. The Sharp FP-F50UW is Energy Star rated, and it will only run at 32W for the lowest setting. But if you need to run it on highest speed, the rated power will be 64W, and it is a bit higher for an air purifier with weak fan like Sharp FP-F50UW. For running the Sharp FP-F50UW 8 hours per day, you need to pay $11 to $23 each year. It is more and more popular for a low-range air purifier to have many additional features. In fact, this is the top selling point for a budget device, especially when it needs to trade off both the air filter quality and the fan power to effectively cut cost. The Sharp FP-F50UW is a great example for a budget air purifier with lots of additional features. First, we need to mention the great Smart Sensor of this air purifier. It can precisely detect the status of the air pollution, and react immediately with the Auto Mode, that change the fan speed to help clean your room better. It also tells you what happens in your room via the light indicator on top of the control panel. I know, it is quite convenient, right? The Sharp FP-F50UW also has a great Child lock function, to prevent your kids from accidentally change the settings of this air purifier. And finally, you have the Timer. Remember to hold it 3 seconds to end the Timer setting if you need. 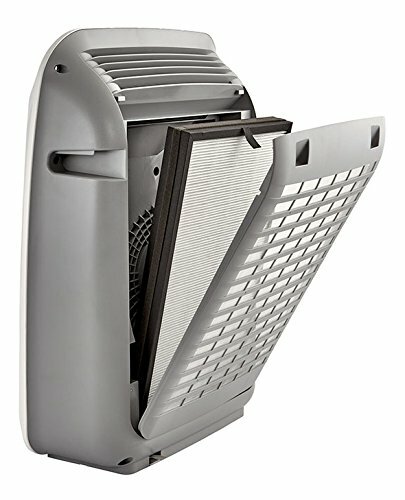 The Sharp FP-F50UW looks good, and the combination of both True HEPA filter and Plasmacluster is the unique selling point of this air purifier. However, for the price, this air purifier is overpowered by many great names in the market, like Honeywell HPA300, Coway AP-1512HH or Blue Pure 211. Should I buy Sharp FP-F50UW? Maybe yes, but only if you can’t find a good deal on the Winix WAC9500. The Sharp FP-F50UW has a True HEPA filter that lasts longer, but it is also for a much smaller room. If you have serious allergies or asthma to airborne pollutants: the Sharp FP-F50UW is great with True HEPA filter and the Plasmacluster technology. If you need an air purifier with a better room coverage: you could look for the Austin Air HealthMate Jr, Austin Air Allergy Machine Jr, Alen BreatheSmart FLEX and Alen BreatheSmart 45i, as they all have better room coverage than this Sharp FP-F50UW. Also, the Oransi Max has the largest room coverage, with 1100 sq ft. If you need a budget version of this air purifier: this is the most budget air purifier of this brand, you should look for the Winix C535, Winix 5300-2 or Winix 5500-2. If you need a more silent air purifier: the Sharp FP-F50UW is quiet for the price, and you can also research for the Winix NK100 or Winix NK105. If you care about the annual filter cost and energy cost: you should look for the Levoit LV-H133, as it has better annual energy cost. The air filtration process is high-quality, but the weak fan power draws this Sharp FP-F50UW back a lot.